Cleansing Greens is the perfect companion for cloth wipes. This all natural concentrate contains the healing properties of hempseed oil. Closest to our skin's natural oils, the hemp seed replenishes moisture while leaving a barrier of anti-microbial protection. Cleansing Greens is also great used full strength for cleaning body and as a refreshing hand sanitizer. One four ounce bottle of concentrate will produce eight 8 ounce bottles of solution, enough for hundreds of diaper changes. 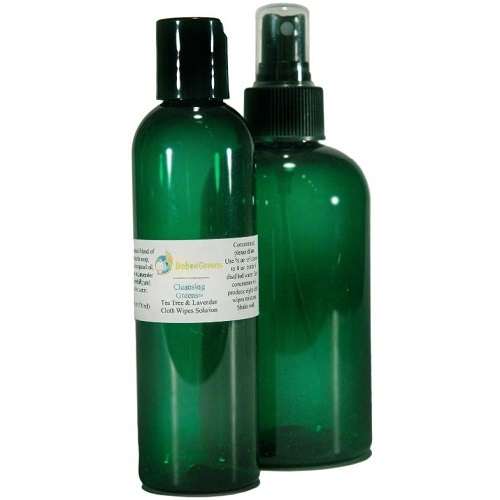 Cleansing Greens Set includes our 4-ounce all natural concentrate and 8-ounce spray bottle for mixing and application. Mandarin Scent provides antiseptic and calming properties as well as a refreshing scent.